Matryoshka nesting dolls, by B Balaji on Flickr. As many people have pointed out (e.g, Lallands Peat Worrier and The Huffington Post), the Tories’ current plans for English Votes for English Laws (EVEL) actually are pretty meaningless at the moment — they would simply give the English MPs the power to block laws from being passed by a majority involving Scottish MPs if the subject area is devolved (like when Scottish MPs were happy to introduce tuition fees in England under Tony Blair), but they wouldn’t allow English MPs to create or modify laws on their own (such as the current relaxation of the English fox-hunting law). In effect, the EVEL rules would basically not have any effect during this parliament (given that the Tories have an absolute majority that doesn’t depend on their sole Scottish MP). They might of course become very important under a future Labour government (if we don’t get independence before that happens), but then they could just abolish the EVEL rules again, given the UK Parliament is sovereign. I have a feeling that many ordinary Tory voters aren’t aware of the current impotence of EVEL, but once they realise, they might get pretty angry and will demand that an even better variety of EVEL is introduced (let’s call it EVEL-ER, borrowing the Chinese word for ‘two’, 二 èr). So what would EVEL-ER look like? Presumably it would actually exclude Scottish MPs from voting on certain laws altogether. Rather than forcing the Speaker to exclude the MPs at random times, it would probably be easier to assign days to each voting group (e.g., English MPs on Mondays and Tuesdays, English and Welsh MPs on Wednesdays, all MPs on Thursdays). In effect, EVEL-ER would set up at least two new parliaments (an English one and an English-and-Welsh one — I’m not entirely sure where the Northern Irish MPs come into the picture), but sharing MPs and facilities with the House of Commons. The new EVEL-ER Parliament would thus be a matryoshka parliament — a large parliament containing a smaller parliament containing an even smaller parliament. EVEL-ER would raise a lot of questions, however. 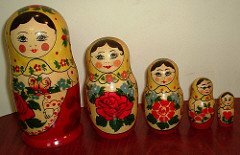 For instance, would the English MPs have their own matryoshka ministers, or would the UK ones simply wear a lot of matryoshka hats? I can’t help thinking it’d be simpler to set up a proper English Parliament (but then I’m not English) or to split up the UK once and for all (but then I’m not a Unionist).